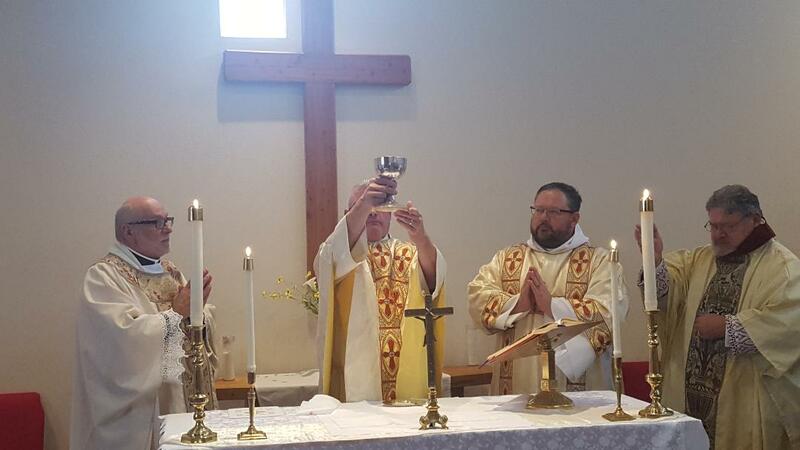 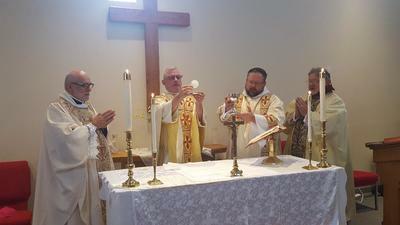 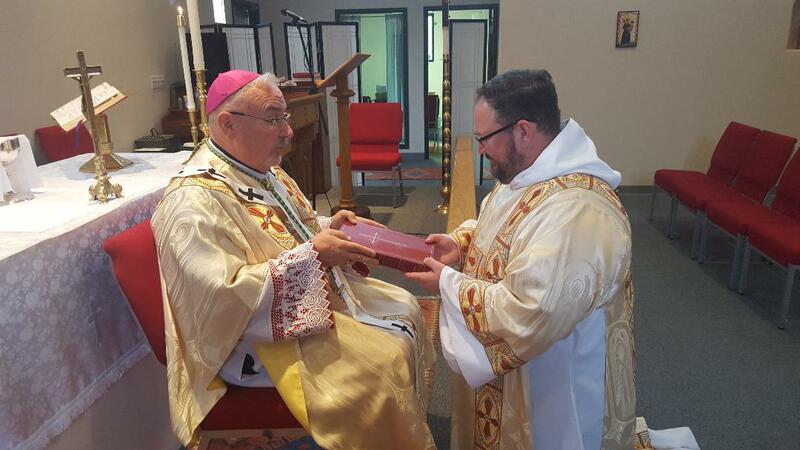 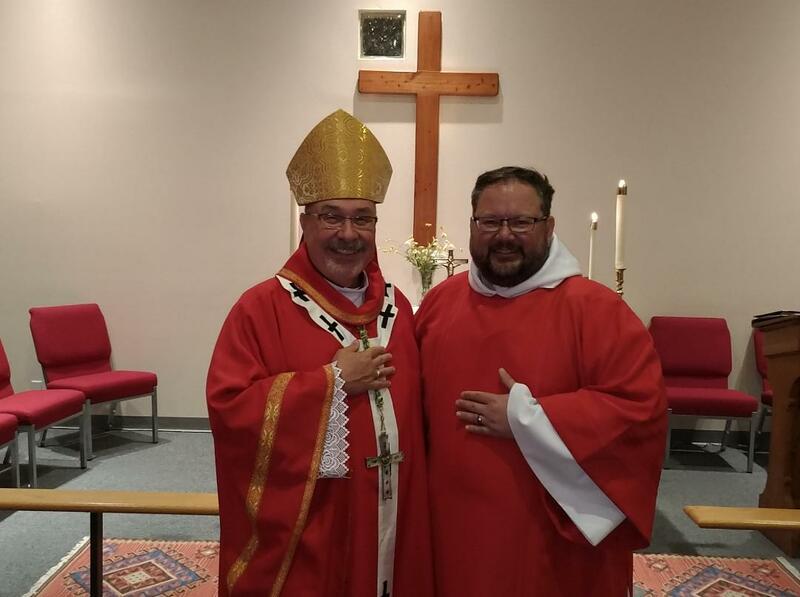 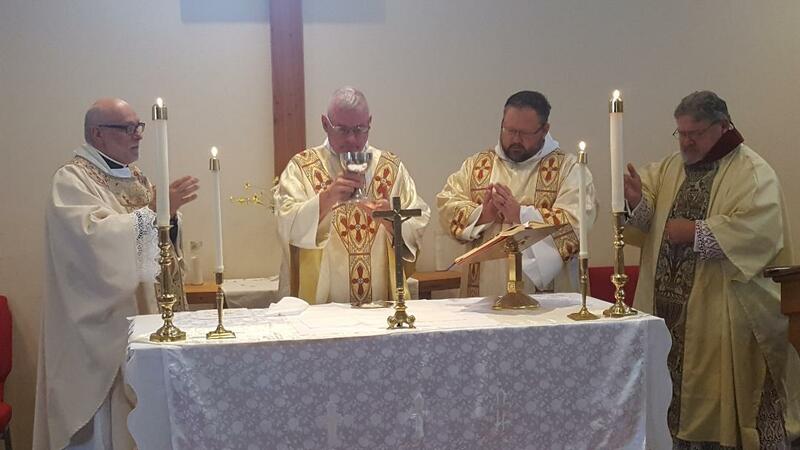 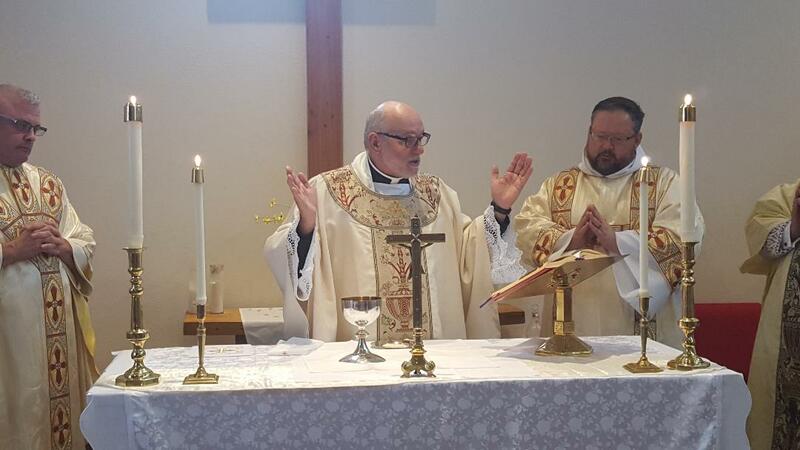 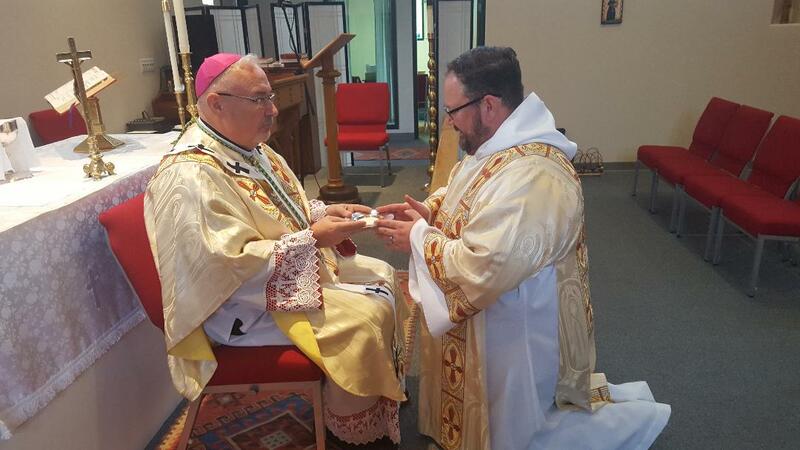 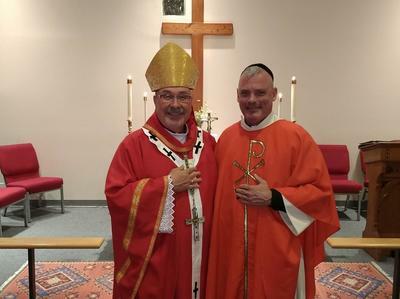 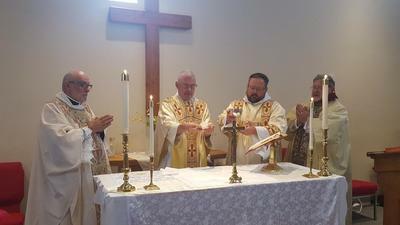 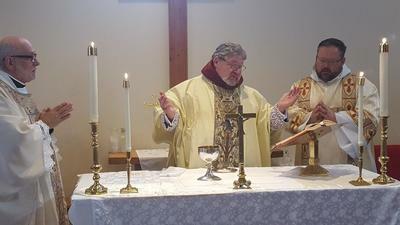 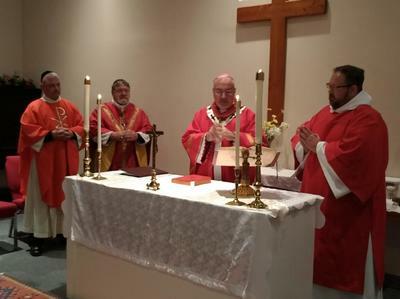 Sub-Deacon Daniel Kitchens II re- committing himself to the duties of Lector and Acolyte by accepting from Bishop Doyle the Lectionary to proclaim Sacred Scripture and the Paten which holds the bread to become the Body of Christ. The Chrism Mass is a celebration of the unity of priests with their bishop. 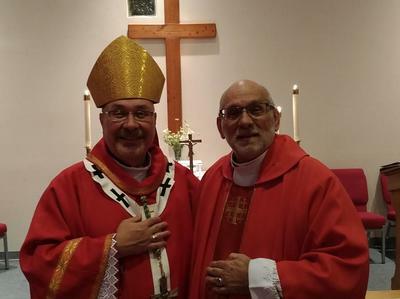 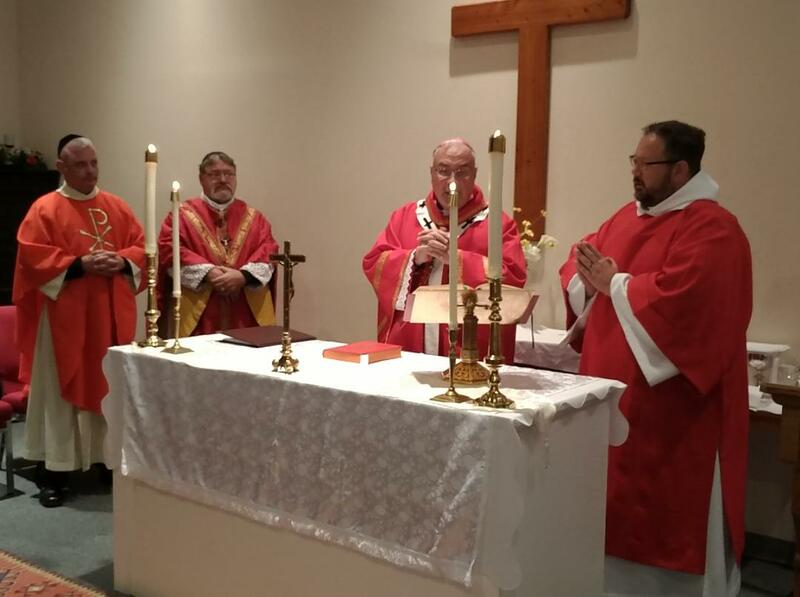 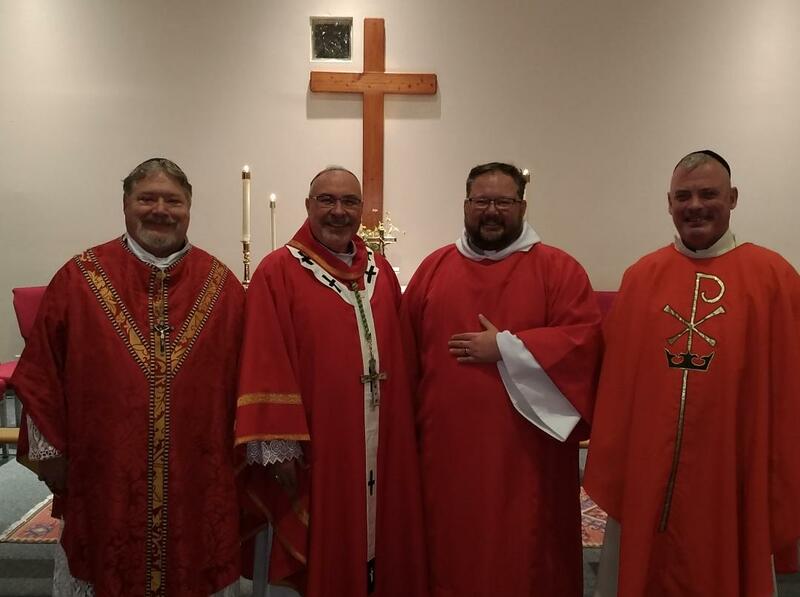 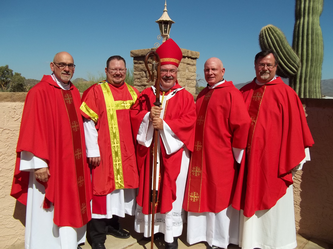 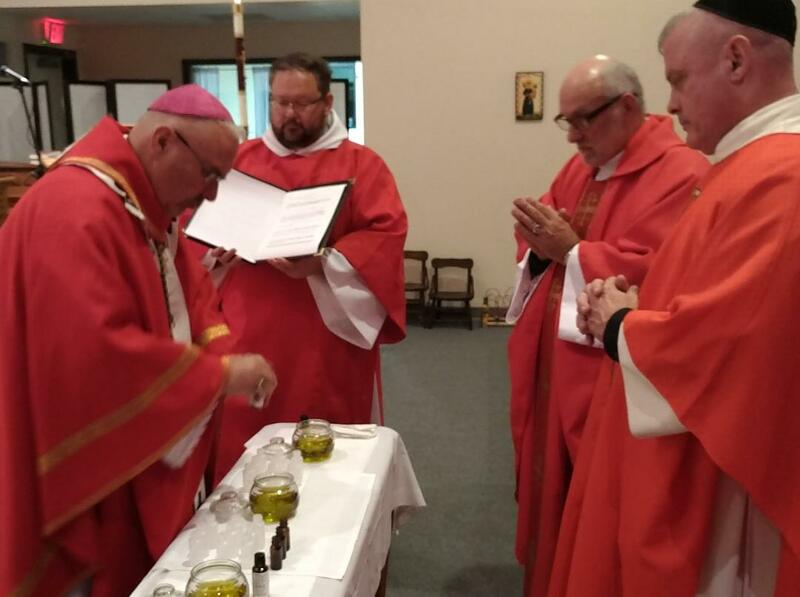 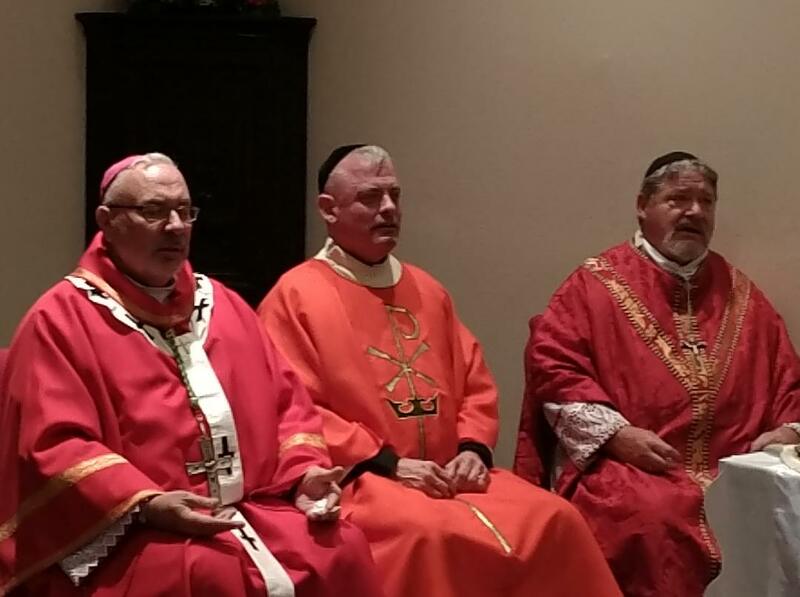 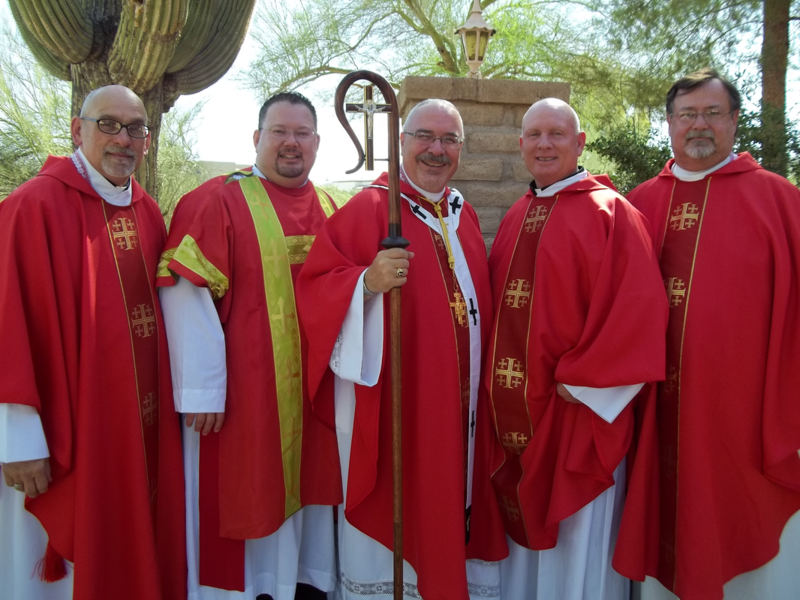 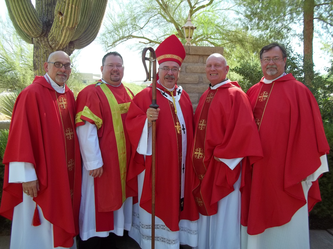 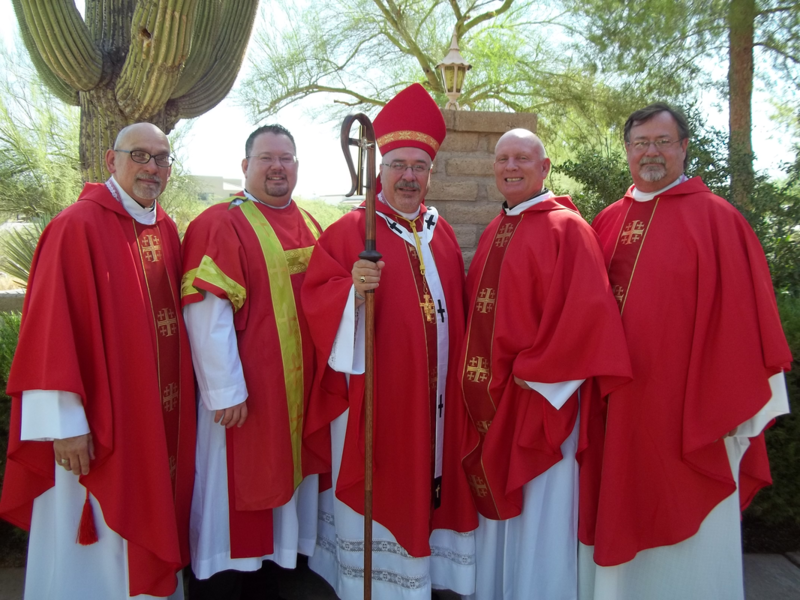 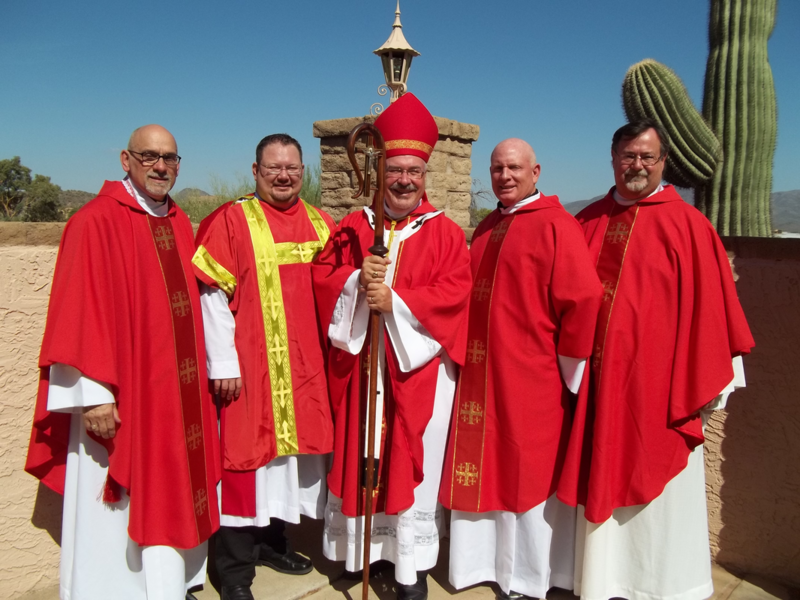 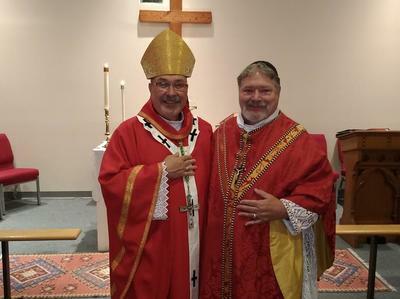 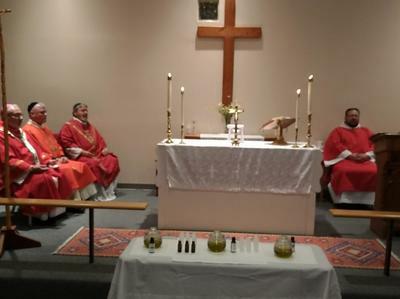 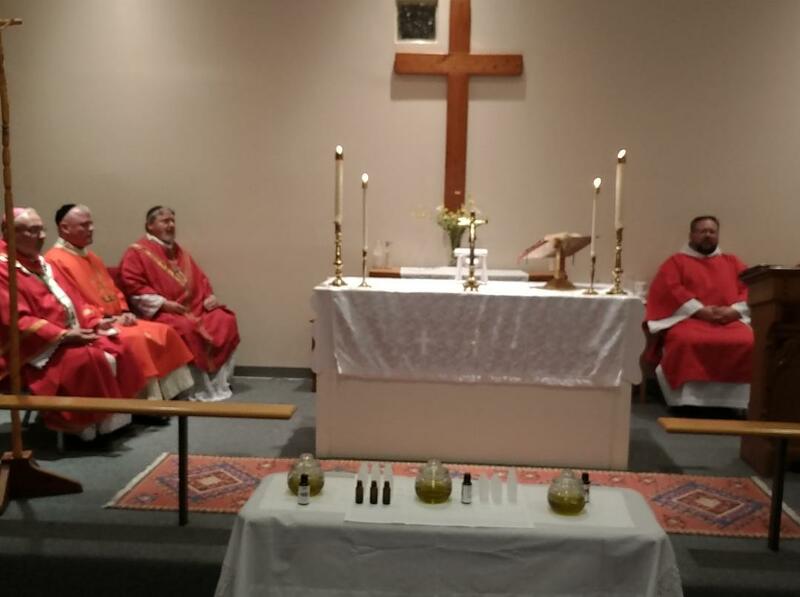 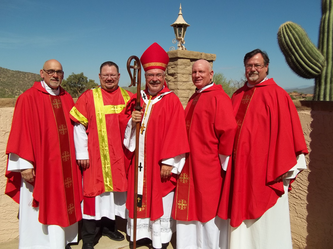 Red is used because the Holy Spirit is called upon to bless the Holy Oils which each priest takes back to their ministry. 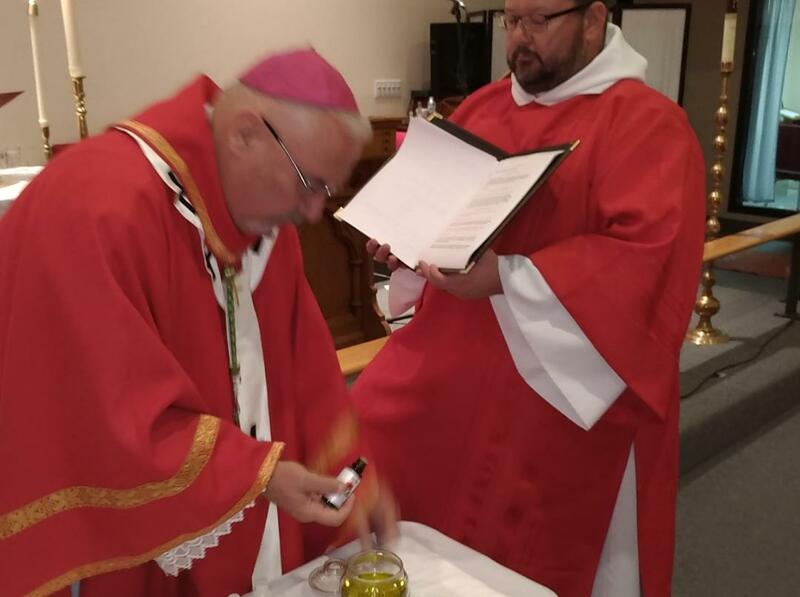 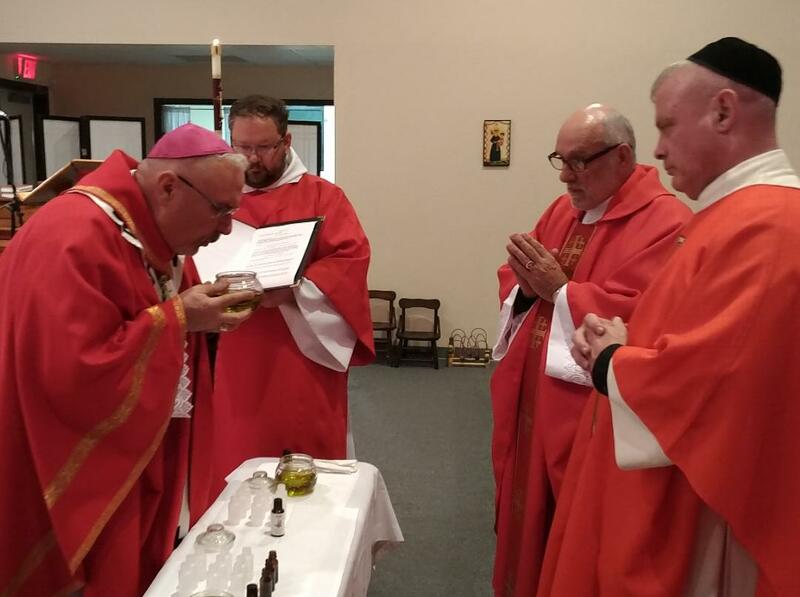 These are the Oil of Catechumens used in Baptism, Sacred Chrism used in Baptism and Confirmation, and the Oil of the Infirm used in the blessing the sick. Bishop Doyle is shown blowing on the Sacred Chrism to stir the oil, symbolic of the Holy Spirit coming upon the oil. 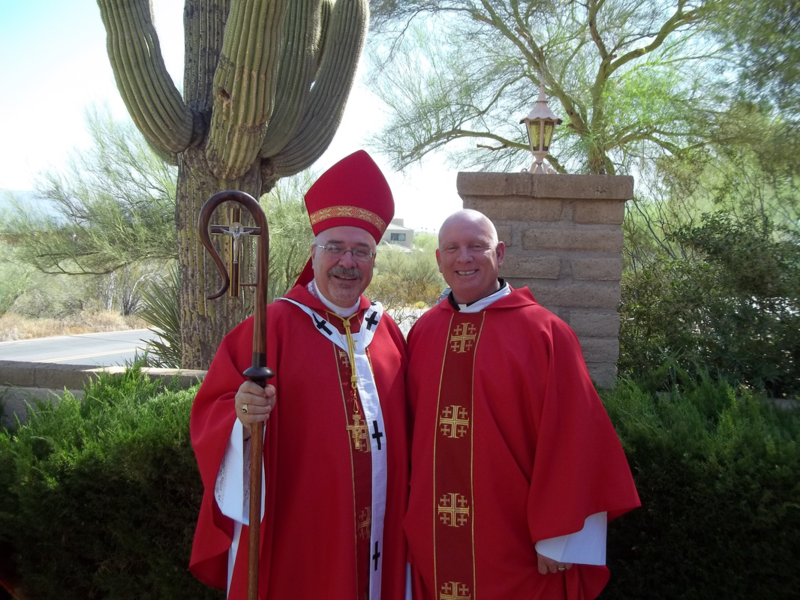 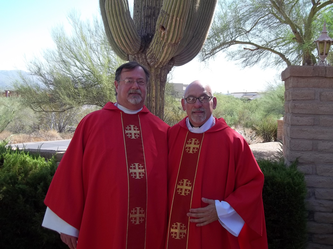 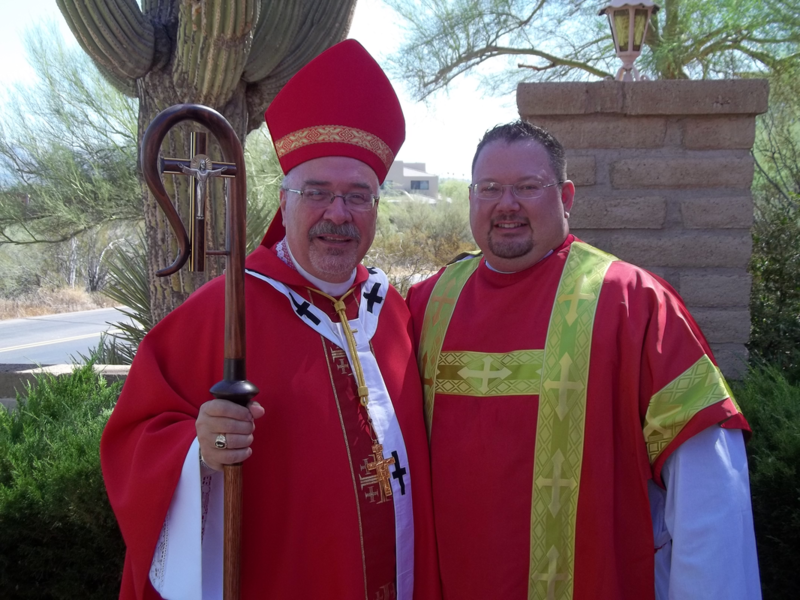 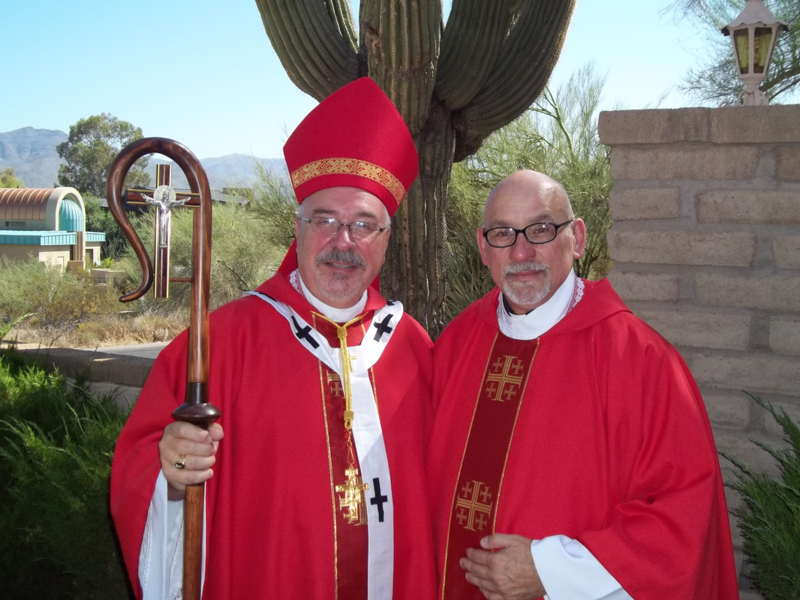 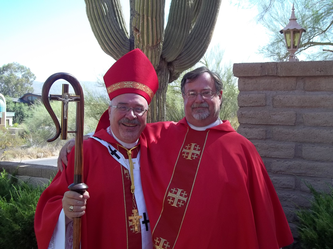 Presiding Bishop Doyle with Deacon Daniel, with Msgr. Scott Burris of California, Msgr. 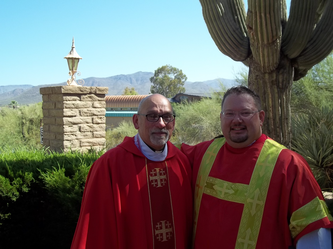 Alex Oneto of Boston, MA, and Canon Mark Schwarz of Albuquerque. 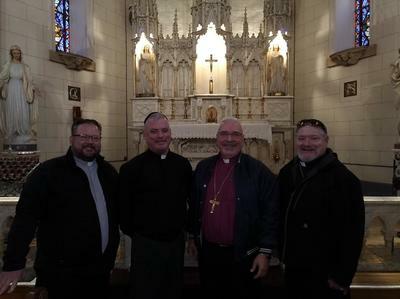 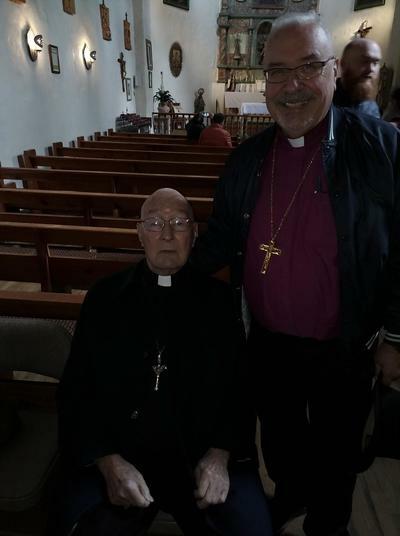 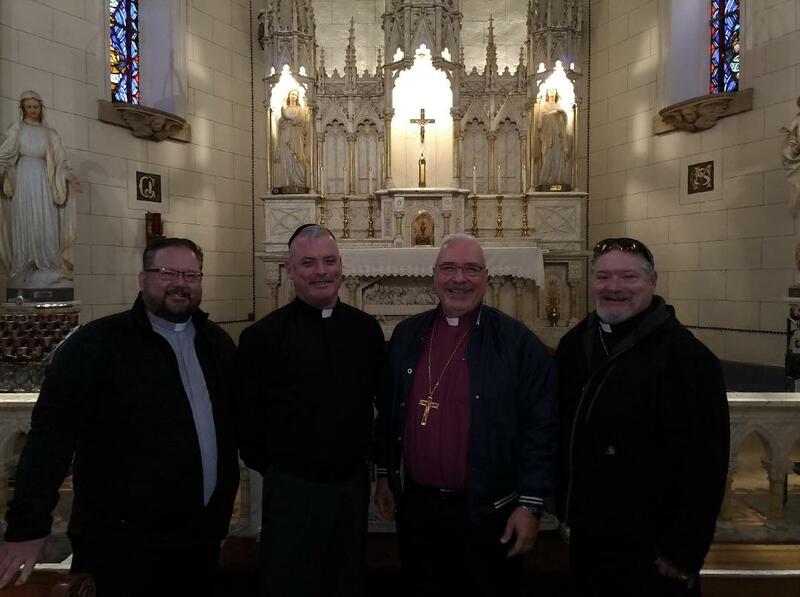 Our clergy visiting Santa Fe and Loretto Chapel, and a surprise while visiting San Miguel Chapel, the oldest chapel in the USA, with retired Bishop Richard Gundrey of Santa Fe. Bishop Gundrey was an original consecra- tor of Bishop Doyle in 1998. 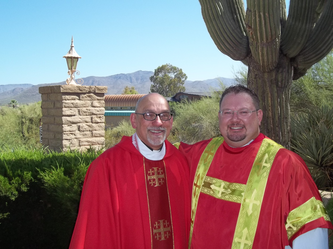 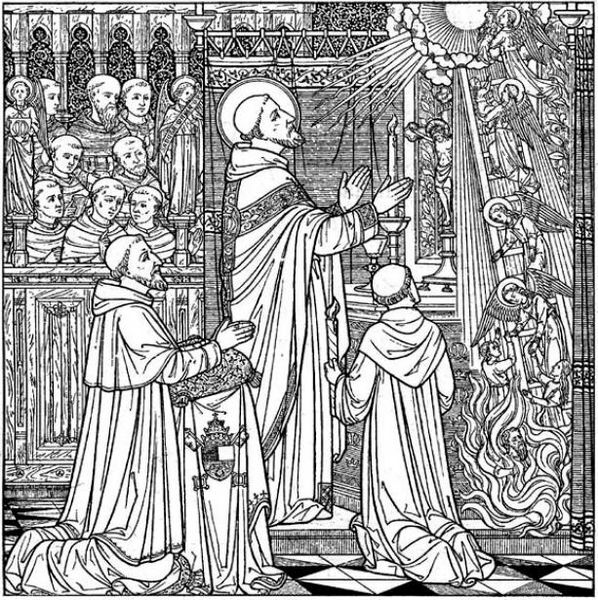 Closing Mass on Thursday, October 18 with Msgr. 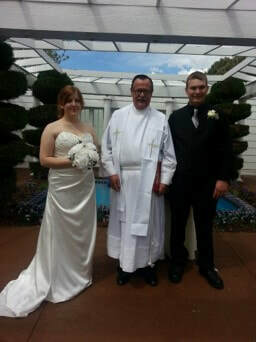 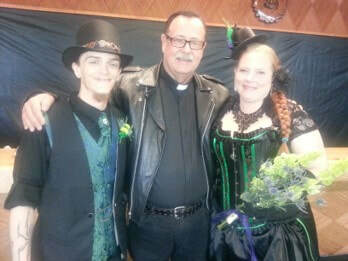 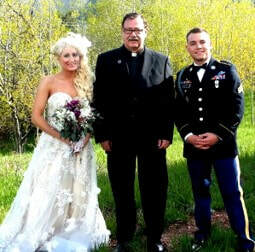 Burris as celebrant. Fr. 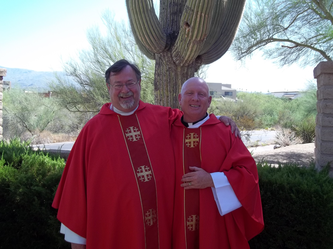 Alex was the photographer for the Chrism Mass and Santa Fe, Bishop Doyle was in attendance and photographer for the Closing Mass. Fr. 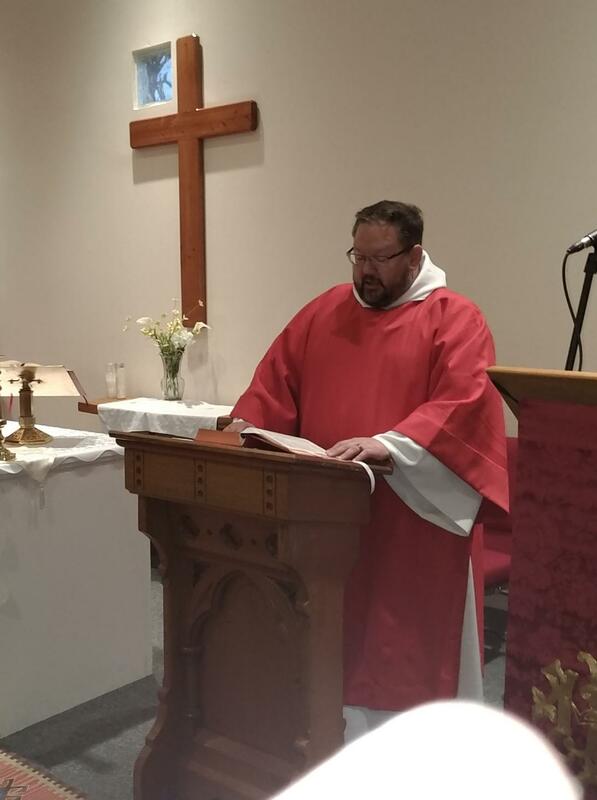 Alex giving the Opening Prayer and the Benediction at the Gay Officers Action League Annual Banquet, Boston, MA, 2012. Fr. 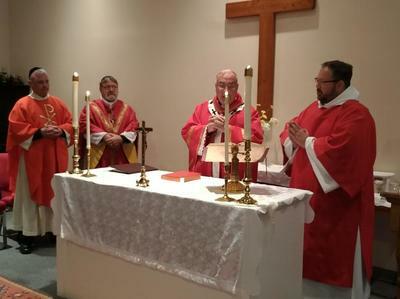 Alex blessing the new ambulance for the City of Boston, MA, October 12, 2012. 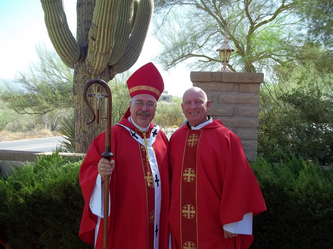 2013 University of Phoenix Graduation with Dr. Nancy McDonald, in Albuquerque.